The three winners of this year’s UA Grad Slam competition, sponsored by the Office for Research and Discovery, were all international students with different educational backgrounds and career goals. The UA Grad Slam is a campus-wide competition for the best 3-minute talk about graduate student research and discovery. Participants are given the opportunity enhance their communication skills by showcasing to the public the innovative research and creative work associated with graduate education. All talks must be live oral presentations and all disciplines are encouraged to participate. Winners are awarded up to $3000 as well as a chance to compete at the statewide Arizona 3-Minute Grad Slam. Khoshmagham is originally from Iran and moved to the states in 2011 to attend graduate school and later receive her Ph.D.
“As a big fan of the TED Talks, I thought it would be a great opportunity for me to try presenting my research in front of a public audience in a limited amount of time,” she said. The central theme of Khoshmagham’s presentation was about utilizing emerging technologies in the field of transportation to improve the safety and mobility for users in the system through “Connected Vehicle Technology.” In this technological environment, vehicles can talk to each other and the infrastructure; and in a very high resolution platform, managing the whole system can be improved. Overall, the main part of Khoshmagham’s research is focused on how to monitor the performance of this technological system for effectiveness and efficiency in real time. Khoshmagham said one of the greatest outcomes of the Grad Slam was that she made a couple of new friends. They met each other several times during the preliminary and semi-final rounds and clicked instantly. “It's enjoyable to go out of the SIE department and find out what other graduate students are doing,” she said. Khoshmagham said it was an “absolutely unforgettable moment” when she won first place. Alex Chibly, a UA Cancer Biology GIDP doctoral student from Durango, Mexico, received second place at the UA Grad Slam for his talk on "Saving lives one salivary gland at a time” and also got second place in the 2016 Statewide Grad Slam competition against NAU and ASU in Phoenix, where he received an additional award of $2,000. 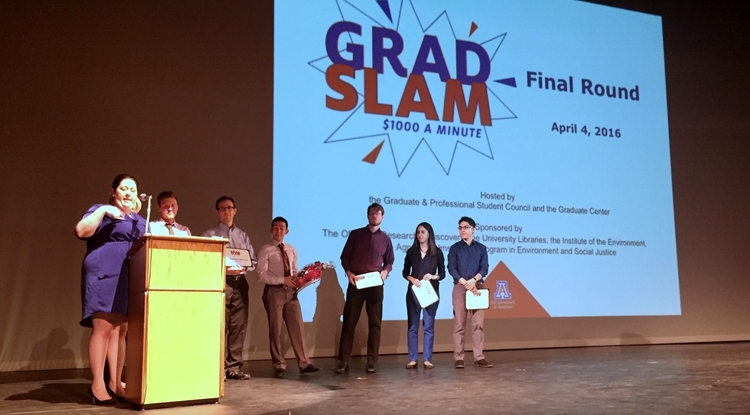 Chibly said he chose to participate in the Grad Slam because he liked the style of the competition where he had the opportunity to present his research in three minutes, “and of course the $3,000 incentive,” he added. Chibly’s presentation focused on the idea that there are currently hundreds of thousands of cancer patients who receive radiation therapy as a treatment, and a significant number of them suffer from life-long side effects of the radiation. Individuals who receive radiation to the head and neck, for example, permanently lose their ability to produce saliva and this leads to severe consequences like difficulty to chew and swallow, oral infections, malnutrition and dental decay. Chibly’s research focuses taking advantage of the body's natural way of healing injuries through stem cells to find or develop therapies that allow salivary function restoration. He thinks the impact of this research will be used to help improve quality of life for head and neck cancer survivors who receive radiation therapy. Chibly enjoyed seeing other people's presentation in a format that's more comprehensible for non-experts and said he is impressed with the quality and diversity of research at UA. Chibly thinks all students should get involved with the Grad Slam. He said international researchers are not uncommon in the U.S., and contribute greatly to push forward science and technology. “Grad slam is a great opportunity to show that and to highlight the importance of international students in the scientific community,” he said.